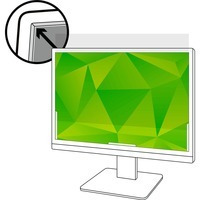 Anti Glare Filter reduces glare and mirrorlike reflections, making your screen easier to use in high glare situations. It can also protect your screen against scratches. Use filter on 21.5 wide screen desktop LCD monitors with a diagonally measured 21 916 viewing screen and a 169 aspect ratio. Actual filter dimensions are 18 34 wide x 10 916 high 477mm x 268mm. Lightweight, thin, frameless design is easily applied and reapplied numerous times with no bubbles. It attaches with optically clear adhesive strips. Easy to clean filter is compatible with most touch screen displays and includes a cleaning cloth.